Science makes the world better? Galileo invented telescope and we can see things far away in the space near us. Thomas Jefferson invented light bulb and now we use LEDs. Abdul Kalam worked on missiles and now India is self reliant in the fields of military technology. Larry Page and Sergey Brin innovated Google and now internet is a possibility even in Sahara Desert. Inventions lead to innovations and inventions does not happen without challenges. Children need to be exposed to challenges and risks from early childhood. Of course risk should NOT be life threatening or harmful to children in any manner. Curious minds learn through challenges and children are better curious. I was in 2nd class; learnt, day time in India is night time in America. I asked my mother, what about London, what about other states in India. She requested one of our neighbor ‘he is eating my head, please teach him. My neighbor taught me about Time Difference. I asked him how to believe (heck he was 23 I was 6+). He tuned to Radio BBC and at 9PM BBC Hindi Aired Time of different locations. Thanks to Marconi for inventing Radio. We can make the world beautiful through Science. Google Science Fair is one such step promised to make a difference in people’s lives. Who can take part in Google Science Fair 2016? Anyone whose age is between 13 to 18 years can participate in Google Science Fair 2016. Rules are bit different for Israel, South Korea and a few countries in Europe. In which countries Google Science Fair 2016 is Open? All world, you can take part from anywhere and submit your science project. What all I need to take part in Google Science Fair 2016? I want to work with my friends? Is this doable? Yes, Google Science Fair is open for both Individuals and Groups. You can join in a group of 2 or 3. You will get a team code on your dashboard. You can work as individual participant or as a team. What I need to do once I enter Google Science Fair 2016? Is there any fee involved? No, Google Science Fair is completely free. Are there any awards or honors given to participants? Yes, there are many: Scientific American Innovator Award, National Geographic Explorer Award, Virgin Galactic Pioneer Award, LEGO Builder Award and Community Impact Award. What is the timeline to enter to Google Science Fair 2016? I am excited, how can I register now? 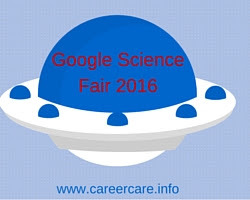 I am a science teacher, can I take part in Google Science Fair 2016?